Movie: "The Space Between Us"
When an astronaut dies giving birth to her son on Mars, the child's existence is covered up for damage control purposes. The boy, named Gardner, grows up on Mars and is raised by a handful of scientists. As a teenager, he is able to video chat and has interacted with an Earth girl from Tulsa named Tulsa. He is eventually allowed to come to Earth where he runs away, finds Tulsa girl, and goes on a road trip searching for his father, but his health quickly dwindles due to the strain Earth's gravity puts on his heart. "The Space Between Us" is directed by Peter Chelsom, who has helmed such films as "Serendipity," "Shall We Dance," and "Hannah Montana: The Movie." With a high quality resume like this, you can see why we had such high hopes for this space drama. Its screenplay is written by Allen Loeb, who wrote "Collateral Beauty" and "Just Go With It." Holy hell, what have we gotten ourselves into? 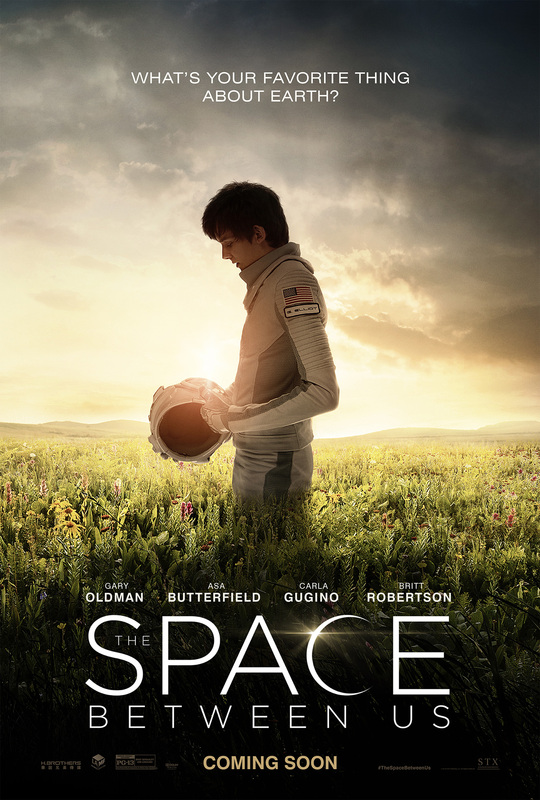 It stars Asa Butterfield as Gardner Elliot, a young man born and raised on Mars by a handful of scientists. He has been talking to a girl named Tulsa, played by Britt Robertson, via an online video chat through the use of an unbelievably fast inner-space internet connection. After a surgery to strengthen his bones, at long last, Gardener finally gets to go to Earth. Upon arriving, he runs away, finds Tulsa, and goes on a road trip to try and find his father, whom he's only seen in a photograph. Joining them are Gary Oldman and Carla Gugino, who spend the entire movie trying to find Gardner because they are concerned about his health because, dear readers, growing up on Mars made his heart..............too big.........that's why he cares so much.......bllllleeeeeeeecccccchhhhhhhhhh. As you may have already noticed, we are not fans of this movie. It is a completely schmaltzy, disingenuous romance with a sci-fi angle that is incredibly stupid. And before you think, "well, Lolo and BigJ are going to critique how wrong and how bad the science of this movie is," no, no we're not, though we very easily could. Rather, the film is loaded with plot holes, contrived moments, trope-y plot devices, and tons and tons and tons of cheese. The dialogue is so absolutely ridiculous that we almost got dizzy from rolling our eyes so much. All of this comes before the absurd twist ending that BigJ predicted before good ol' Gardner was ever even born. The movie mostly runs through a 'fish out of water' scenario where Gardner is in complete awe of Earth and everything he sees. He seems ignorant of the fact that horses even exist, which doesn't make sense since he is clearly highly educated thanks to the internet. He is shown to have an amazingly fast broadband connection and so, one must assume, he has all of the perks that come with such advancements. He lives with about a dozen or so scientists, yet he acts like he has never had interactions with human people in his entire life. There is even a line where he tells Tulsa, "you make me feel human." Uhhhhh, hey dumbass? YOU ARE HUMAN! Despite having an earth-shatteringly quick internet connection, he has only seen a few movies in his entire existence (does Netflix no longer exist???? ), mostly DVDs of flicks from the studio era of Hollywood that were left behind by other astronauts before they went home to Earth. Luckily, his astronaut pals were fans of classic romances, so Gardener can mimic Earth in a cutesy, charming way and learn how to behave like a human (even though HE IS ONE). Just imagine if the scientists were Grindhouse horror fans and had left behind DVD copies of "Cannibal Holocaust" and "Maniac!" Gardener would have had a totally different outlook on Earth and how to act once he got there! Luckily, "The Space Between Us" has special effects which are very well made, so it's not a complete bore to look at. The design of the future sci-fi elements and space vessels look convincingly done, especially on a $30 million budget. We're not huge fans of Asa Butterfield outside of his performance in "Hugo,"and his performance is monotonous and idiotic. Most of the other actors try to put on good performances, but unfortunately, the material here is just pure trash. Gary Oldman, we love you, but what the hell are you doing in a project like this? We know most romantic dramas are supposed to be blatantly tacky, but this movie brings about a level of tawdry we didn't know existed.